"If I am mad at you, I'll kill you, and you will never get away from me unless you shoot me or kill me." Richard Kuklinski is a bad, bad man, currently in prison serving a ninety year sentence for murdering six people as a member of the Gambino crime family. Truth be told, Kuklinski claims to have killed at least one hundred people during his life, and he did it all for his family. Not to impress them or because they asked, mind you, but so he could support them and offer them a happy life. It is this sort of admission that makes The Iceman Interviews: Confessions of a Mafia Hitman so fascinating. The piece takes away all of the �cool� aura of the mafia and boils it down to a man and what made him do the horrible things that he has done. Originally seen on HBO as part of the network's America Undercover series, this three-part DVD release finds Kuklinski behind bars and amazingly open. Kuklinski is an amazingly complex man, one who admits that many of his killings were done simply out of either boredom or simply because he wanted to test out a new weapon he had. The Iceman: Conversations With a Killer is the first of the three parts, and in this piece kuklinski discusses his motives and how he was able to live a seemingly normal life with a family who never knew of his horrific activities. Kuklinski is surprisingly calm and candid when discussing his personal life and career, including his policy to never kill a woman and the assertion he's not a serial killer, as he derived no thrill from horrific things he's done. The middle piece, The Iceman: Secrets of a Mafia Hitman, deals more with Kuklinski's history as a mafia hitman since the age of fourteen. He performed the murders for the Gambino crime family and others who were willing to pay enough for his services. Kuklinski discusses instances of where and why he decided to take a life. Once was simply because someone crossed the line and came to his home in suburban New Jersey. The most incredible confession is of a rather disturbing experiment, keeping a dead body in a Mr. Softee ice cream truck for two years to try to disguise the time of death. 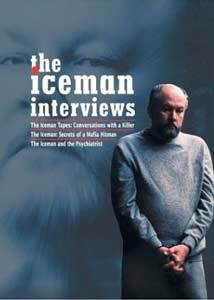 Finally we have The Iceman and the Psychiatrist, a candid interview with Kuklinski and Dr. Park Dietz, a forensic psychiatrist. Dietz does an incredible job of getting Kuklinski to open up about nearly every aspect of his life, including just how he was able to juggle his life as a family man, a businessman, and a contract killer. This final piece acts as a sort of "best moments" collection from the other interviews, but this time around they all seem much more interesting because of the mental chess game between Kuklinski and Dietz. On a technical level each of the three documentaries are very well done and incorporate real crime scene photos as well as reenactments of some of the crimes discussed. There is very little you will not know about Richard Kuklinski's life as a killer by the end of these three segments. The viewer is also treated to interviews with experts in the field of criminal psychology who discuss at great lengths Kuklinski's personality and how he could do these horrible things and have no remorse or regret. Image Transfer Review: The Iceman Interviews is presented in its original 1.33:1 aspect ratio, and for the most part the transfer is serviceable. Colors look remarkably solid, and the dark grays and blues of the interview rooms come off looking deep with no grain. There are a few instance of shimmer and artifacting, though. Audio Transfer Review: The Dolby Surround track is largely anchored in the center channel, and dialogue is crisp and clear throughout. There is some activity in the left and right speakers, but this is largely a center channel based mix. The Iceman Interviews is a fascinating look into the mid of one of America's most prolific and frightening killers. Highly recommended.